I regret that the subject of the first post of the new year will be Tommy Waller, but evil doesn’t take holidays. In fact, it seems to ramp up around the holidays. Even now, Xians are pouring into Israel for “The Feast”, as they do every year at this time, and all of them are looking for a weak place through the Jewish armor to reach the Jewish soul and steal it for Yeshu. A few people have asked my opinion about the new video of Tommy Waller calling on his fellow Xians to renounce “replacement theology.” Sadly, I must tell you that absolutely nothing has changed here. Since the beginning of their ministry, the Wallers have said that they do not want Jews to become “Xians,” i.e., give up Jewish practice and ritual, but they do want them to be “messianic” Jews, i.e. believers in Yeshu (without giving up Jewish ritual). Giving up replacement theology simply means agreeing that Jews, as Jews who believe in Yeshu and go to “synagogue” instead of church, ALSO have a place alongside the rest of Christendom. This is just a last, sad and bad attempt on the part of Xians to reel in the Jewish fish by trying to convince them that they can live on the land and yet remain fish. In the past, a Jew who believed Yeshu was the messiah had to convert to another religion, leave the synagogue forever and go to church. As a demonstration of his sincerity, he was required to eat a ham sandwich. Why? Because, according to the Xians of those times, God was through with the Jews and had a new people known as the church. If a Jew wanted to be counted as part of God’s people he had to give up on being a Jew and become a Xian. What Tommy Waller and his fellow “Israel-loving” Xians claim to have suddenly discovered is that a Jew can remain a Jew and still come to faith in their Yeshu, who is also reclaiming his Jewishness in these latter days. They still believe that only those who put their faith and hope in Yeshu will be redeemed, but it includes both those who identify as Jewish as well as those who identify as Xian. The two are “one new man” with their shared belief in Yeshu and together they are equal heirs of the promises made to the forefathers: Avraham, Yitzchak and Ya’aqov. Tommy’s little speech is absolutely nothing new. It’s the same thing Jews for Jesus has been saying for the past fifty years. This is just another misguided attempt to convince Jews to take another look at Yeshu, to present him and his message in a more acceptable light. Your problem is – you are still wrong. Yeshu was NOT a good Jew. He was NOT G-d. He was a man who sinned and died for his own sins. He saved no one, not then, not now and not ever. He never was and never will be the Messiah. I am no expert in body language but in a recent video highlighted on a missionary website caused a high count on my cringeometer. The recent video highlights a new partnership between Hayovel and The land of Israel Network. In the video, one of the two Rabbis present possibly displayed fawning deference to his own role and the roles played out by the others during the video. Via the body language I could almost hear him asking himself the questions, “how is thing going to fly, what are we doing here and what have we gotten ourselves into?”. After being welcomed on stage by Gimpel and the HaYovel team, Finto expresses his gratitude at seeing “what’s happening among Christians, believers in jesus, coming together, united together for ‘your’ purposes”. Finto lays his hand upon Gimpel’s shoulder and blesses him and Hayovel. This is followed by Finto’s prayer in the name of jesus, as well as Finto’s Hebrew version of the priestly blessing. An extensive list of HaYovel activities and the Wallers may be found at the Jewish Israel site. A survey of the facts indicate that quite the opposite is true, HaYovel is heavily committed to the evangelical mission of converting Jews to jesus/ yeshua from 2004 to 2015 at the very least. Do some of our Rabbis know what they are doing and what they are enabling? The paradox of how supposedly learned men can fall for this type of thing is not new, apostasy and idolatry is something that has plagued the Jewish people for centuries. The NT says that the root of all evil is money, I think missionaries know what they are doing and what they are trying to achieve. How can we Jews be so subject to such enticements? What will it take? When our sons and daughters want to intermarry? By then it will be too late. It is nothing new but will we ever learn from playing with idolatry? Worse of all and more cringeworthy is how some Jews presently expect us all to acquire collective amnesia to the facts and go along with madness since the ends of political correctness along with financial gain justify the means ….apparently! Its like as if we have not been warned many times previously! Commenter Goldie ZP asks a very important question. Settlers living on the western hill of the religious community of Har Bracha recently sent a letter to the community secretariat, protesting the housing of Evangelical Christians in their neighborhood. According to the residents, the presence of the Christian volunteers – who arrived to work in the community’s vineyards – violates the fabric of their society, and as a result – they hardly leave their houses. “When we came to live in a religious community, we never imagined that one of these days we would be forced to live alongside people of a different religion, which doesn’t match our faith and lifestyle,” the residents wrote. …The Christian volunteers are part of a large group of American volunteers affiliated with Yuval – a pro-Israel Evangelical organization. The group includes dozens of people, and their stay in Har Bracha was made possible after the community rabbi, Eliezer Melamed, met with them and ruled that they are not missionaries. It’s my understanding that the Jews were forced to leave that area, but I have no documentation of it. Having noticed the unselfish and unwavering support year after year of the volunteer organization HaYovel led by Tommy and Sherri Waller from Nashville TN, Rabbi Eliezer Melamed has taken an initiative to establish a Christian Zionist Visitor Center on the Mount of Blessing in Samaria, in order to strengthen and encourage Christian support for the so called settlers. Rabbi Melamed is Head of Yeshivat Har Bracha and is a prolific author on Jewish Law. He is well known in Israel and has a popular weekly column in the Beersheva [sic] newspaper called “Revivim.” At the moment he is gathering other rabbis in Israel to get behind his historic initiative with a visitor center open for Christians on the Mount of Blessing. Does the fact that the missionaries perform avodah zarah in the vineyards and/or believe that the wine will one day be part of a central Christian religious ritual affect the kashrut of the fruit or the wine? But, they say “Ha-Shem.” How is that avodah zarah? Glad you asked that question. They’ve been coached to use our terminology, but they don’t mean the same thing by it that we do. So, who are they speaking about when they say Ha-Shem? Following are five examples taken from Messianic websites where they identify who they mean when they say Ha-Shem. 1) “The Name” in Hebrew is hashem [sic]. 2) Since Jesus is the Name (HaShem) above every name (Phil. 2:9-10) and HaShem means God it looks as if Paul is saying that Jesus is God. 4) ..the first century Jewish Christians did not refer to “Jesus” they called Him The Name, yeah! that would be HaShem. Well, some Jews claim that this is still ok because these people no longer believe that Yeshu is G-d. Oh, yeah? Some call me a Messianic Jew or a Hebrew Christian. Let’s just say I’m a Torah observant Believer in Yeshua (Jesus). …I thought I’d address some of the Scriptures that I believe show that Yeshua is YHWH. …we have Yeshua claiming to be the I AM. That is He claimed to be YHWH who spoke to Moshe (Moses) in the burning bush. I have drunk the wine from the hills of Samaria. That is the wine that, one day, the Messiah will drink at the great reunion in Jerusalem for all His Believers!! …What if you were among the workers, who picked the grapes, of the winery from which the Messiah picks that big bottle of wine??!! These wedding preparation vineyards have, over the last 5 years, expanded exponentially in Samaria and Judea. It certainly looks like Abba is expecting a large gathering! I’ve consulted a kashrut authority who is currently investigating. Disclaimer: I don’t like labels as it pertains to Torah identity. I don’t love the term “orthodox Jew”, modern-orthodox, etc. Personally, I would prefer the term halachic Jew, but some of the most aggressive religious innovators insist that they are acting in a halachic manner. On the other hand, I have zero patience for those who nit-pick with ridiculous semantics. In this article I use the term orthodox Jew, because sometimes terms become deep-rooted in a communal identity, and the desire to shake the root free is both wasteful, unnecessary, and sometimes counter-productive. I use the term when referring to religious rabbis who believe in the absolute Divine nature of Torah, and the mass revelation at Sinai. Once upon a time, there were giants who walked amongst us-giants of Torah. Men with wisdom to combat the modern idols of secularization. Men who defended the integrity of the Jewish synagogue and the Jewish family from goyish modernization. Men who spoke with deep wisdom in defense of the deepest truths. Men who understood that modern definitions of feminism, woman’s rights, and similar minded ideologies spoke more of the faulty psychology of their respective advocates, than of any new-age modern revelation designed to liberate women from being women. Once upon a time, great men of Torah fought for yahadut. Today, there are few if any prominent vocal voices. And so, whenever the new radical voices in the Torah community (who speak in the name of Torah) speak violence to the system, there is deafening silence. On issues that should transcend all labels and factions, and appeal to everyone concerned with protecting Halachah, one feels the void. Ironically, some of the most blatant outrages occur in Israel, where unbridled Jewish messianic fervor renders many Jews vulnerable to aberrant belief systems. Consider the spectacle of orthodox rabbis giving a kosher seal to evangelicals and missionaries in Israel because of a distorted notion of achalta de’geula (a pivotal point in time auguring moshiach). Consider how one prominent Rabbi in the heartland of liberated Samaria opened up his community to evangelicals in order to benefit from their free labor. Today, these evangelicals have transitioned from living in tents to dwelling in cottages. On a more general level, how is orthodoxy supposed to cope with the following? Rabbis with kipot and beards who reflect on a morality independent of Halacha? Rabbis whose readings of Torah verse and Talmud require a torturous misreading of the written and articulated meanings? Rabbis whose usage and defense (if only for application regarding what they believe to be “antiquated” injunctions, and not every day Halacha) of this tactic remind me of the perverse attempts of “Jewish Renewal”. Religious Rabbis whose interpretations of of Divine injunctions mirror the tactics of maskilim new and old. Rabbis who see metaphor in the biblical injunction to destroy Amalek and the 7 Nations of Canaan. Rabbis who believe in a “new Halacha.” Rabbis who opine that Rambam and others spoke for their age alone. Religious Rabbis who advocate for homosexual marriage. Rabbis for Hillary Clinton and her leftist anti-Torah positions. Rabbis who engage in biblical criticism. Rabbis who wish to free Spinoza from his well-earned excommunication. Rabbis for “open-orthodoxy” and the ordination of women. Rabbis whose well-intended but misguided notions will surely lead the next generations on the path to a new reform movement. I worry about the future of Judaism. Not for its ultimate survival, since our tradition is stronger than any threat we face. But the war will come at a cost. The cost of souls lost to heresies new and old. Once upon a time, giants of Torah fought for truth against the ‘reformation’ of Torah. Today the Torah community is as weak as ever. Not in terms of over-all Torah study. In that context, there is more Torah study today than ever before. But with the rise of social media, and the new movements pandering to all sorts of foolishness, Torah Jewry is intellectually susceptible. We lack sophisticated courageous Torah leadership to stand up for unpopular truth. Even the RCA has shown an inability to reign in radical thought. How long did it take for them to take a stand against the growing clamor of the new “orthodox” to ordain woman? The great men are gone. The classic men of past generations who fought critical battles for the preservation of Torah are gone. Today’s religious rabbis shirk their duty to protect their flocks. Worse yet, many lead their flocks astray. Factionalism render’s certain camps relatively insulated from some of these heretical voices. For the time, at least. One attraction of these new voices which will appeal to the disaffected of every community, is that some of these new prophets raise valid points about institutionalized rabbinical abuses which represent a chillul Hashem. These real issues act a springboard to hoist radical ideas. The fact that a stopped clock tells accurate time twice a day does nothing to change its general status as a broken instrument. Yet the willingness to admit abuse speaks of a candor which people find impressive. The answers are usually less impressive, and are usually more grounded in feelings than Jewish law. But one cannot ignore the real issues, and the attraction of those who address them. One must find better solutions reflecting Torah positions. “Orthodoxy” doesn’t need to change, despite the popular insistence that it must. Corruption is by definition contrary to Torah. If it is corrupt, then it cannot be orthodox despite the identification as such by the corrupt. We need to aggressively return to the truths of Torah. Where are the giants who fought for halachic integrity? These great men are gone. Today we have silent men. Fearful men. People afraid to confront those who seek to ordain female rabbis in the name of orthodoxy, and those who would rather create a new Halacha to free chained women, rather than call for Jewish men to break open the heads of recalcitrant men. Today, we have Rabbis who in the name of compassion, will create leniency where none can be found, and in turn, will create mamzerim. The greatest and most sensitive poskim of the past, were sometimes hamstrung by halachic reality. They understood that non-halachic compassion will destroy the Jewish people. In the name of political correctness, some may opine that the Rambam’s words were for his age alone, and that the Nesher could never have imagined a Jewish state in a modern age. My understanding of the Rambam is that he foresaw much more than his modern day detractors ever could. Unlike others, he wrote about biblical wars precisely because he understood that the process of redemption will occur, and war will be necessary. In the name of religious tolerance, many distort the Meiri in a way that he could never have imagined, as a source for all sorts of prohibited activities. The Meiri never could have fathomed a prominent religious America rabbi in America entering a national church for Obama’s initial swearing in ceremony. No one puts a gun or a sword to a Rabbi’s head in America, and yet he entered a forbidden place of his own volition. Political correctness has infiltrated orthodoxy making orthodoxy increasingly susceptible to liberal sensibilities. Now is a time for intellectual zealousness for Hashem. Men of Torah need to face the new heresies and radical innovations, and intellectually combat the religious proponents of these foreign notions. An orthodox Judaism which fails to heed today’s call, will suffer in the coming years. The impact will affect even the most insulated communities. One day, the orthodox will awaken from their slumber and cry out for action. What will they do? They will create conferences to deal with the new “crises”. But by then, the bleeding will be copious. About the Author: Donny Fuchs made aliyah in 2006 from Long Island to the Negev, where he resides with his family. He has a keen passion for the flora and fauna of Israel and enjoys hiking the Negev desert. His religious perspective is deeply grounded in the Rambam’s rational approach to Judaism. There have been many self hating Jews who have knowingly attempted to drill a hole in the boat which represents the Jewish people’s collective reliance on each other for their mutual survival. For many years the boat has seen many drilling attempts! In a new twist we see another dynamic taking place under the rubric of Jewish-Christian relations. The boat is occupied and populated not only with Jews but now with ‘invited’ Christians who love Israel. Guess who has gone to Church [Christ Church Jerusalem] today! Slowly and stealthily a new agenda pitches the idea that those lovers of Israel being loaded onto the boat will not be a problem. Anyone on the boat by virtue of being part of the Jewish people who raises just an eyebrow will be quickly branded as a hater. A hater because they fail to see that the new initiative has no holes drilled in the boat…….. apparently. We may note at this point that rocking the boat, overloading the boat are other ways included in the ways of sinking the boat. Glitzy marketing along with literature, slick videos, custom tours and conferences such as the 2016 Shavuot Conference, Celebration and Tour by the Commonwealth of Israel (COY) folks gives a prime example of loading the boat up with the lovers of Israel. There shall be no Conversion attempts by any party WITHIN the activities and communications of COY Projects – this applies as much to proselytizing Jews by 10-Israel as to conversion promotion by Judah towards Ephraim. Ephraim – There shall be no discussion, witnessing, quoting of NT for proselytizing purposes (by Ephraim). Judah – There shall be no bad mouthing, condemning, de-Messianising attempts towards Ephraimites. Theological differences will NOT be allowed to bring division –the rule shall be to agree to disagree with respect and friendship. There shall be NO muzzling of what any party to COY teaches in their own capacity outside of COY communications. The basis of our Reconciliation shall be to build on that which we agree upon (Ref. the ‘Areas of Commonality) above. A recent video “The Gate Of Heaven” shows the above rules of engagement in action where a rising young star of the Waller family (headed by Tommy Waller) is seen in his enthrallment of the land of Israel in a recent promotion of ‘biblical tours’ where the scriptures come alive. The Wallers have trashed their old web presence and now have a relatively gospel-free site at Hayovel.com. However, they and their harvesters continue to share jesus and express an ever-more overt and fervent Christian end times message via YouTube, Facebook, blog sites, video productions, documentaries and newsletters. The warm fuzzy glow produced by the first four points in the rules of engagement above is no doubt to serve to pacify the natives of the boat that no one is drilling those holes in the boat. The points in the rules of engagement above however, reflect Greek thinking that every point can be viewed separately with no interaction/ interconnection between the points. Somehow we just have to pretend that all is OK, the Christians invited onto our boat are not drilling holes on the bottom of our boat. AND WE JEWS WERE BORN YESTERDAY!! The spiritual enemies of the Jewish people who harvest the Samarian vineyards take no sabbaticals during shemitah. They of course refrain from picking grapes for the year, as they must, out of deference to the enduring Mosaic shemitah Law. Yet the most important crop of all is harvested year-round regardless of season. Evangelicals see every season as a time to bring the “good word” to Jews, or to be blunt, to harvest Jewish souls. For the devout evangelical, the Jewish soul is sweeter than grapes, and like all difficult quarry, the religious Jew is most desirous, since he represents the challenge of an elusive prey who poses an eschatological road-block. The kind of prey who supposedly can’t be caught, yet according to their religious beliefs, must be caught, in order for the “Second Coming” to arrive. Trying to bring religious Jews to the cross is no easy task, as long as Torah Jews remain insulated from evangelicals. As such, they require the aid of Jewish insiders to penetrate the castle. And they have found them. Previously insular communities in Israel are no longer a fortress. The missionaries have discovered that for the right price, their religious Jewish friends will open the door. More than that, at least one prominent religious-Zionist rabbi has even sanctified his presence in the agricultural fields by declaring that “the harvesters” are fulfilling prophecies. And these same Jewish friends battle on their behalf by hurling defamation and invectives towards the few Jews who have the courage to say anything. And so it should come as no surprise that Tommy Waller’s “Hayovel Ministry” is working overtime during shemitah, even as the vineyards of Samaria remain dormant for the year. The off season is when they return home to their American congregations and communities to amass their forces. Now is the time to schlep Jewish representatives around with them on the speaking circuit, to generate energy and excitement as they try to bring “the good word” to Jews in Israel. It is a labor of love. This is where their cadre of Jewish friends come into the picture; those perplexing individuals with kipot and tzitzit who have participated in some of the most outrageous interfaith events to date. When I speak of “religious Jews for Jesus” I am not speaking of actual messianic Jews who believe in Jesus and accept him as divine, but of those religious Jews whose clarity has become so blurred and distorted due to their involvement and exposure to evangelicals. I speak of rabbis who have described Jesus as a rabbi, and as a “kosher” concept that Jews can embrace without sacrificing their most basic Jewish beliefs. I speak of “Halachic” Jews who have either unconsciously or otherwise mastered the tongue of Christian theology, as they try to harmonize inherently contradictory teachings, out of a desire to strengthen an alliance with Christians. I speak of those who are engaged in activities that no religious Jewish leader in history ever engaged in. I speak of those who would been condemned by great Rabbis in previous generations, when we had strong Torah leadership. Hayovel and other evangelical missionary groups require such Jews. 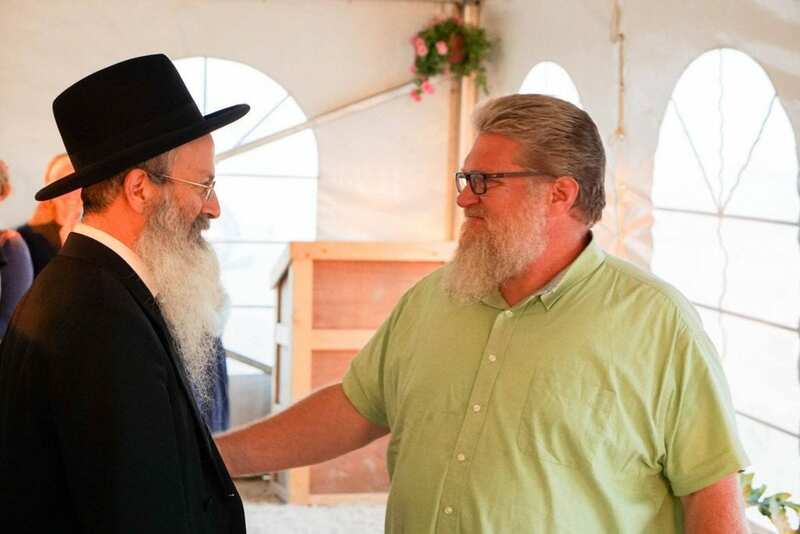 They require individuals like Jeremy Gimpel, a renowned Jewish advocate, radio personality, and ordained orthodox Rabbi, who has done as much as anyone on the scene, to grab the evangelical hand and pull him in for an interfaith bear hug. “JewishIsrael” recently came out with a shocking expose regarding Gimpel’s participation as the main speaker at a Hayovel sponsored event in Nashville. Every Jew must read this disturbing article and watch the accompanying video. The jaw-dropping finale featured Caleb Waller inviting the notorious Jew obsessed missionary, “Papa” Don Finto, onto the stage to bless the audience. (A brief internet search will tell you all you need to know about Finto.) Don Finto proceeded to lay his hands on Jeremy Gimpel to bless him and Hayovel, and even concluded with a recitation of Birkat Kohanim! And all throughout this whole disgraceful episode, Gimpel remained on stage. I need not go into great detail, since the article presents all that transpired. Yet I would like to reiterate one salient point to the reader. Bear in mind that this is yet another documented example of Hayovel’s missionary agenda. Despite the same shrill cries of their Jewish enablers, Hayovel’s sponsored event saw Caleb Waller invite a notorious Jew missionary to bless the audience. Those who would still deny their intentions are either cognitively impaired, naïve to the point of cognitive impairment, or lying for any number of reasons. There are no other logical explanations. As an aside, while I have never met Jeremy Gimpel, he and his co-host Ari Abramowitz were kind enough to have me as a guest on their Voice of Israel radio show a while back to discuss my articles addressing the dangers of evangelical support for Israel (minute 27). I found them to be genuinely friendly and warm, and they gave me a fair opportunity in the allotted time to present my views. In short, I harbor no animus towards Jeremy or Ari. I liked them both. There is nothing personal here, save for my concern over what I consider grotesque violations of Jewish behavior, in the form of the most extreme examples of prohibited interfaith dialogue. As I hope to show, from a Torah perspective, Jeremy’s responses were outrageous. Many were inaccurate and theologically ambiguous, and some even bordered on the kinds of positions that could be deemed heretical or worse. Indeed, Jeremy’s own words could Heaven forbid be used one day to ensnare Jews. In one of the more egregious examples of blurred theological lines that invariably ensue from such encounters, one former student of “The Rav” even adopted the language of the missionary, and he was featured several years ago in videos where he called Jesus “Rabbi Jesus,” and used such ideologically problematic terms as “branches” and “grafting,” which are laden with unmistakable Christian associations. The missionaries had a field day with this trove of material. Is it any wonder that we have a new category today, of a religious Jewish activist who engages in the kinds of things that none of our forebears would have ever thought possible or permissible? Quoting the Gospels: Early on in the session, Jeremy referenced the “humble of spirit” and participated in a rare spectacle which boggles the mind. Consider the image of an ordained rabbi standing before an audience of evangelical missionaries, quoting from the book of Matthew (5:5). “The meek will inherit the earth,” declared Jeremy,“that is the spirit of the bible.” My response: When a rabbi quotes “Matthew” what more can one say? Can there be a greater desecration of Hashem’s name? “A Jew Is a Jew”: In response to an inquiry from a participant about the status of a Jew who converts to Christianity, Jeremy responded that despite a Jew’s attempt to leave the faith, he nevertheless remains a Jew. While this is generally accepted as true according to Halacha, Jeremy failed to emphasize that despite the Jew remaining a Jew, acceptance of Jesus as either divine or a messiah is inherently incompatible and contrary to Jewish beliefs. Even Jeremy’s mentor,Rabbi Shlomo Riskin, (who has been involved in questionable interfaith- exchanges himself) has explicitly stated: “Jews can never accept Jesus as the Messiah – anyone who does so is ipso facto not a Jew…” Acceptance of Jesus is the antithesis of Jewish belief. Jeremy’s failure to point this out plays right into the hands of the missionaries who maintain that such a belief actually makes the Jew more “Jewish” by “completing” him. Jeremy: “To answer really simply, maybe everything that you believe in the book of Zachariah, that the messiah will do, we believe too. I mean that’s why the argument is sort of like…uhh …it’s not a waste of our time… but like….When a man comes and he fights the wars of Israel, defeats the enemies, builds a temple, peace on earth, the leader that did that, we will all kneel before the king. (Jeremy actually kneels down.) Do you know what I mean? Response: There is no commonality whatsoever between the Jewish understanding of a righteous human Messiah who will fulfill all the Halachic criteria and fights the wars of G-d, and the pagan notion of a divine man (part of a triune godhead), who died for mankind’s sins, was resurrected, and will eventually return in a Second Coming. The latter belief is for those who sacrifice their rational faculty to accept a theology borrowed from the major pagan religions of the ancient world. In a final attempt to harmonize the validity of the two faiths, Jeremy expressed his perspective on how the arrival of the messiah will play out, in a way that accepts the legitimacy of both. Response: Moshe Emet V’Torato Emet. The words of Moses are true and his Torah is true. Judaism 101. With all due respect to the other faiths who maintain a similar position about their own beliefs, we are not both correct. The truths of Judaism are inherently in opposition to Christianity and there can be no harmonizing of the two faiths. The truths of Judaism and Torah are the only truths. There is no theological crisis. Since Jeremy referenced a historical Jesus, a few words need to be said about the question of the historicity of Jesus. Jews who speak of a historical Jesus who was both “religious” and even a “rabbi” are playing a dangerous theological game. The obvious conclusion of such thinking is that you can “follow” him and still remain a good Jew, the same position which the messianic argues. The missionary’s challenge is to expand upon this concept and convince the Jew how to follow Jesus. Not only is this a perilous path, which from the onset is contrary to Jewish thought and Law, it also blindly accepts the notion of a historical Jesus as a fact. The Talmud never mentioned a “Jesus of Nazareth.” The Tosefta and Baraita reference two different men that people mistakenly associate with Jesus. Take Yeishu Ben Pandira for example. He was never crucified. He was stoned to death for sorcery and hung from a tree. This occurred one hundred years before Jesus, during Alexander Jannaeus’s reign in Jerusalem. Yeshu Ben Stada presents other problems. He lived one hundred years after Jesus. And while his manner of death and subsequent hanging for sorcery on the eve of Passover are the same, he was killed in Lydda. These were clearly two different personalities, and neither of these men were killed by Romans. They were executed in different towns, and neither was killed via crucifixion. The dates don’t correspond to the dates of Jesus that Christians accept. Did Jesus exist according to rabbinical sources? Rabbi Jehiel ben Joseph said that the Yeshu referenced in rabbinic literature was a disciple of Joshua Ben Perachai, and NOT Jesus the Nazarene. Nachmanides rejected the idea that the Talmud referenced Jesus, whereas Maimonides maintained that it did. (Norman, 186-187). Believing in an historical Jesus is not a fundamental tenet of Judaism. Ultimately, the historicity of Jesus is irrelevant for the believing Jew. But believing in the ideas associated with him is not irrelevant, and they constitute a rejection of everything Jewish, and a descent into idolatry. And the theology that is based upon the figure of Jesus is prohibited to the Jew as idolatry according to all rabbinic positions. Jeremy Kashers Jesus: Jeremy continued to stumble, by explaining that a theoretical belief in Jesus as the Messiah is not problematic, as long as he is not deemed divine. As proof, he cites the unfortunate case of what has transpired in the Chabad world which is rife with the tragic belief that their deceased Rebbe is the messiah. Jeremy incorrectly maintained that this aberrant belief is acceptable to mainstream religious Jews, in a sense, by arguing that it boils down to the theological equivalent of one’s preference for apples and another man’s penchant for oranges. It suggests that the challenge can be intellectually met, and that theoretically someone could present an idea that could bridge this gap and make the idea palpable to Jew. It challenges the missionaries to overcome this hurdle. It also defines the “hurdle,” and feeds the missionary agenda. Response: Here I find it difficult to convey what I am feeling, because I am screaming inside. WHAT? No problem to believe in Jesus as the messiah? Of course there is! Jesus, real or imagined, never fulfilled the criteria to be the Jewish messiah! Furthermore, we Jews believe in the coming of the messiah, not the messiah himself. Allow me to explain. The messiah will not require a blind belief, because by fulfilling the criteria, he will identify himself to be the correct individual. Jesus met none of these criteria. Judaism rejects Jeremy’s notion of atonement as being compatible with Jewish belief. It is not. He can cite “mystical Judaism” which is a vague term that doesn’t mean anything. We don’t believe in a dead messiah who didn’t complete his mission. By its very definition, death is the most obvious proof that one was not the Messiah. Yet the most troubling notion can be found where he states, “So there is so much that there is what to work with.” What does this mean? If ever there was an open invitation to the missionaries of the world to accept Jeremy’s ambiguity as a call to try harder, this is it. This is a call for missionaries to become more creative by working with Jeremy’s concept of a flexible ideology, in order to harmonize Jesus. This was an outrageous statement that was as dangerous as a hail of bullets shot into a crowd of Jews. What is there to work with? What does that even mean? Reflections: Jeremy and others often present these interfaith events as a unique and new opportunity in Jewish history to engage in a form of Jewish outreach to Christians. When I was interviewed on his radio show, he admitted to me as much. I rejected the notion that even if one could avoid the problems of interfaith dialogue, one could never engage in outreach with evangelical missionaries. I recommended that we Jews invest our time with the righteous gentiles of the Bnai Noach world instead. There are so many of them today. It is interesting to note that at the conclusion of this event at the chapel, Pastor Steve Mitchell reiterated and reaffirmed for the audience, the primary Christian beliefs, as I see it, to negate any of Jeremy’s final words. These evangelicals are clearly not open to becoming B’nai Noach, and they themselves do not want their flock to believe that Judaism offers an alternative path to the truth. They are firm believers in their faith, and their uncompromising belief in a divine Jesus, and we should understand this without accepting the naïve notion that it’s a mitzvah to engage with them. Our own people will only lose spiritually in such an encounter, because the evangelical isn’t interested in reason, but the blind faith of dogma and indoctrination. And his theology allows him to engage in duplicity to lure the Jew in. Selective Vision. As the old adage goes, we see what we want to see. As complex people we all engage in this delusional process to some extent. Selective sight allows us to continue to live the way we want, and avoid the things we refuse to confront or accept. There are many reasons we ignore the obvious. Some dwell in darkness because ignorance can be comforting. Some of us prefer not to dwell on things that make us wince. We sometimes wear filters over our eyes to ensure that our world schema remains intact. And yet, taking human psychology into the equation, I still cannot fathom how Jews allow themselves to be deluded by these dangerous organizations. As I’ve noted many times before, there is a world of documentation confirming the dangers of the evangelicals in Israel. And thanks to JewishIsrael’s recent article, we now have yet another piece of video footage exposing the notorious Waller family and their Hayovel Ministry’s missionary agenda. The vitriolic responses of those self-appointed Jewish leaders who aid Waller and others, cannot negate the facts, even if they choose to cast them aside. Various efforts are underway to apprise major Jewish leaders and organizations of the full extent of this spiritual menace, which is not monolithic, but an elaborate network of missionary organizations. Many Jews are ignorant of the problem. Many more allow themselves to remain so. There are several good rabbis who are mortified about what is going on, and yet for some reason, they lack the courage or the organizational ability to take a strong stance. So we continue to fight the lonely battle to chip away at their resistance. Because if we don’t fight the good fight, the spiritual death toll for the Jewish people will be incalculable. Every Jew in turn can do his part by writing about this problem, speaking with other Jews, and informing their community leaders. Jews need to write letters to major Jewish organizations both in Israel and across the diaspora, demanding that they publicly acknowledge the problem and articulate an aggressive plan of action. Of course, the battle needn’t be left to religious organizations. All concerned Jews are welcome to contribute. A major part of the effort to combat this spiritual period of “shmad”requires that we publicize all of the major personalities who work with these evangelicals. As such, the actions of Jeremy Gimpel and others must be exposed. “Good intentions” are no excuse, when Jewish souls are in danger. Ironically, many of the same Jews who promote the evangelicals are upset when Israel consistently appeases the murderous beasts of Fatah who mask their true intentions, which mirror the genocidal dreams of Hamas and Hezbollah. Yet they fail to recognize Fatah’s spiritual equivalent, and on this issue at least, they show the equivalent stupidity of any card carrying member of “Peace Now.” Learn to recognize the missionary equivalent of the duplicitous Arab. Learn to recognize “Brother Esau” who comes to us with a smile, lots of cash, a willingness to harvest grapes for free, and an undying enthusiasm to bring the “good word” to us. Learn to scream,“mechabel” – “terrorist” – even when the assailant holds nothing in his hand but a cross and a fervent desire for you to kiss it. Learn to comprehend his duplicitous language, so that you can read what is really in his heart. Here’s a brief lesson to get you started. Conversational Evangelical Language 101: When he says “the Father” he really means Jesus. Don’t delude yourself. Our visions and beliefs are incompatible. Santayana’s words are certainly true for the Jew. History always repeats itself. Har Ha’Carmel 2015. On February 22nd Jeremy Gimpel an educator, radio host, and Deputy Director of the World Mizrachi Movement was the featured speaker at an event in Nashville sponsored by HaYovel, a ministry founded by Tommy Waller. Hayovel brings hundreds of messianic and fundamentalist Christian volunteers to work with farmers, especially vintners, in Judea and Samaria. Since 2009 JewishIsrael has been monitoring the Waller family’s extensive network of missionary collaborationsand associations. JewishIsrael has been alerting the Jewish community via online reports as well as through private and public presentations. We have also provided information to rabbinic leaders who have formulated a“Document of Principles” regarding the acceptance of monetary and manpower assistance from Christian organizations or individuals. Joshua and Caleb Waller as well as Luke Hilton, all from HaYovel, hosted the evening in Nashville, which put the spotlight on Jeremy Gimpel and his personal story, visions and interpretation on prophecy. At the conclusion of the event, Don Finto, a notorious Nashville-based missionary known for his aggressive and public campaigns to bring the Jews to jesus, took the stage at the behest of Calev Waller. The Jewish community was widely exposed to Don Finto’s agenda when he made an appearance in 2011 at a mass rally in a Texas stadium with messianic associates, and openly prayed for the conversion of the Jewish people. The “Response” prayer rally, the brainchild of then Texas Governor and presidential candidate Rick Perry, made international headlines and was a source of national debate in addition to causing concern in America’s Jewish community. Finto’s more recent views on rabbis, Judaism, and what goes on in the synagogues continue to be disingenuous and condescending. That Jeremy Gimpel has recently been promoted on the speaking circuit as Orthodox “Rabbi Gimpel” should make his appearance on stage with Don Finto all the more discomforting. As far back as 1997 Don Finto was making waves and headlines with his sermons and promotion of the Christian mandate to convert the Jewish people. At that time, Reform-Progressive Rabbi Stephen Fuchs held the line for the Jewish people and was able to deliver a firm response that would put many of today’s younger Orthodox rabbis and Torah observant activists to complete shame. A good number of Jeremy Gimpel’s responses delivered to an audience two weeks ago at Fellowship Bible Chapel appear to be noncommittal, fawning and ambiguous at best. And, in the opinion of JewishIsrael, Gimpel’s “open-ended” approach to Jewish-Christian theological relations could actually encourage those looking forward to a missionary harvest. JewishIsrael expressed concern about a possible association between Don Finto and Tommy Waller of Hayovel in its November 2013 report Evangelists, Politics and Shomron PR – The Pew of It All. At that time, blogger “Geula Girl” picked up the ball and a few days later posted an in-depth look at those connections on her website, “Esav Exposed”. It would have been hard for Jeremy Gimpel not to have known about Don Finto. Had he not been informed of Finto’s appearance at the conclusion of his presentation he could have chosen a dignified, appropriate and halachic response by leaving the stage during the Christian prayer session. Certainly Jeremy Gimpel now knows that his Hayovel sponsors endorse, honor and are close with “Papa Don” Finto. One wonders how Gimpel feels after being used by Hayovel to legitimize and empower the likes of Don Finto. In addition, Gimpel’s personal family photos (including wife and children) and stories from his family history are being used to publicize and raise funds for an organization which has consistently shown itself to be missionary in nature. And the dangerously naïve and ironic answer being given is that the Jewish people are strong enough and well educated enough in their faith to withstand any missionary threat from people who truly love us. Unfortunately JewishIsrael needs to remind those Jewish leaders who sit in yeshiva halls and radio broadcasting booths, as well as those held captive by loving Christian donors and congregations, to remember that there are reportedly hundreds of thousands of Jews worldwide who have converted to Christianity since the establishment of the State of Israel. They have been the target of countless numbers of active Evangelical missionaries whose inspiration and urgent need to bring Jews to jesus has been inspired by the rebirth of the Jewish state and by what they see as the end-times role for the Jews according to Christian scripture. Christian Aliyah is another solution being pondered by those Jews who have for years been fanning the flames of evangelical fervor. Perhaps more than the missionaries, the Jewish people should be afraid of some of their own personalities and leaders who are apparently incapable of recognizing a spiritual foe and holding the line when their faith and people come under a centuries-old threat. It is especially poignant when one considers that in this past week’s special Torah reading for Parshat Zachor, we Jews are commanded to remember those who attacked the frail and vulnerable among us. In part two of this post we will explore Jeremy Gimpel’s recent appearance at Fellowship Bible Chapel in Colombus Ohio.